QUESTION ONE: Will Boardwalk Empire gain back any of the nominations it lost in 2013? In 2011, after Boardwalk Empire's rookie season, the show was nominated for 5 major Primetime Emmy's including Outstanding Drama Series, Best Lead Actor (Steve Buscemi), Best Supporting Actress (Kelly Macdonald), and 2 Best Director nominations (Martin Scorsese & Jeremy Podeswa). In 2012, the show lost two nominations as Kelly Macdonald failed to earn a nomination and the show only had one director nominated. In 2013, the show only had two nominations: Best Supporting Actor (Bobby Cannavale) and Best Director (Tim Van Patten). Steve Buscemi and the show itself seemingly lost both of their nominations to House of Cards last year. So will the HBO prohibition drama earn back any nomination it lost? While I personally enjoy Boardwalk Empire, the perception of the show is that it's all flash and no substance. It's created by Oscar nominee and Sopranos alum Terrence Winter and produced by Martin Scorsese and HBO, so it has the appearance of greatness, but unfortunately, it is not regarding as one of the best dramas out there anymore. The show's biggest problem at the Emmy's though is that the drama field has just become so damn crowded, and HBO making True Detective a Drama Series as opposed to a Mini Series has made things worse for Boardwalk Empire. If I had my choice, Downton Abbey and Homeland would stop earning nominations to make room for shows like Boardwalk Empire, but unfortunately I am not the czar of the Emmy's (although I will gladly hold that title!). The six Outstanding Drama Series nominees from last year, Breaking Bad, House of Cards, Downton Abbey, Game of Thrones, Homeland, and Mad Men, all aired new episodes during this Emmy eligibility period, and if one of those shows does get knocked out, (I actually think Homeland will fail to earn a nomination this year) then True Detective will be the first show to take its place. Unless the Emmy's make a bold move and decide that *two* shows that earned a nomination last year will fail to earn one this year, then Boardwalk Empire will regain its nomination title. The similar logic holds true for Steve Buscemi's nomination. I think 5 out of the 6 actors who earned a Best Actor in a Drama Series nomination last year, will earn one again this year, and the 6th nomination (Damien Lewis from Homeland's empty spot) will go to Matthew McConaughey from True Detective. HBO has A LOT of things to promote and I believe that True Detective and Game of Thrones will be their top priority, thus screwing over Boardwalk Empire. QUESTION TWO: Will the show have another nomination in the Best Supporting Actor category this year? It's certainly possible, but I think it's unlikely. Last year, for the first time in 3 years, Boardwalk Empire had a nomination in the Best Supporting Actor in a Drama Series category. Long time bit part actor Bobby Cannavale played the show's easily-tempered, psycho-sexual, Big Bad during Season 3 of the show. It was an extremely showy performance that Cannavale played spectacularly. He was not only rewarded with an Emmy nomination, but with an Emmy win. For Boardwalk's latest season, they added another famous actor to play the new Big Bad- Jeffrey Wright. I think Wright is a bigger name than Cannavale having parts in Casino Royale, The Hunger Games: Catching Fire, The Ides of March, and Syriana, and I'm sure he's just as well respected as Bobby Cannavale is within the industry. However, Jeffrey Wright has some huge hurdles standing in his way if he is to earn a nomination. For starters, there's no "Boardwalk Empire" slot in this category as there is a "Game of Thrones" and two "Breaking Bad" slots. The fact that Boardwalk Empire had a nomination in the Best Supporting Actor category seems like just a one time thing. I think Dean Norris and Aaron Paul from Breaking Bad, Jim Carter from Downton Abbey, and Peter Dinklage from Game of Thrones are guaranteed a nomination. I think either Many Patinkin or Damien Lewis from Homeland will earn the 5th nomination, thereby leaving Wright to take the 6th. However, if HBO decided to screw with Boardwalk Empire even more, it might make Woody Harrelson from True Detective a Supporting Actor as opposed to the Lead Actor that he is in an attempt to get as many nominations for True Detective as possible. If that's the case, then I think Harrelson earns the 6th nomination leaving Wright the first man out. Secondly, Wright's Valentin Narcisse is not nearly as showy and over-the-top as Cannavale's Gyp Rosetti was. I think Wright does the better acting and has the more villainous character, but I don't know how well that will shine through in his Emmy submission episode (whichever episode that may be). 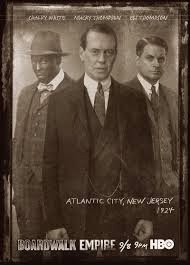 If you watched the entire season of Boardwalk Empire then you can clearly see how great of a performance Wright gave, but I doubt very many Emmy voters actually watched the full season. Lastly, Wright would possibly have to compete with his co-star Michael K. Williams. While I think if any actor not named Steve Buscemi gets an Emmy nomination from Boardwalk Empire, then it will be Jeffrey Wright; however, I do think there will be a small minority rumbling for Michael K. Williams. Williams played best character (Omar) on The Wire, had a bit part in the Oscar winning 12 Years a Slave, and his fan favorite character of Chalky White finally came into prominence during Season 4 of Boardwalk. As a good majority of Empire's Season 4 was the war between Valentin Narcisse and Chalky White, Michael K. Williams has just as good of an Emmy submission episode as Wright does. However, Jeffrey Wright is still the bigger name, and I'd bet he's the guy HBO will push the hardest come Emmy selection time. So in conclusion, I think the show will have a Best Supporting Actor in a Drama Series nominee, Jeffrey Wright, but only if Woody Harrelson from True Detective isn't in consideration for this category. QUESTION THREE: Is Boardwalk Empire guaranteed to get ANY nominations in 2014?! Absolutely. Director Tim Van Patten is guaranteed a nomination. Tim Van Patten has 9 directing Primetime Emmy nominations in his career including earning a nomination in each of the past three years- once for Game of Thrones, and the past two years for Boardwalk Empire. Van Patten even won an Emmy for directing the Season 2 finale of Empire. There are certain directors the Emmy seems to love, and Van Patten is one of them. Tim Van Patten directed the Season 2 and Season 3 finales of the HBO drama and earned an Emmy nomination for doing so; therefore, the easy bet is to say he earns another nomination for directing Boardwalk Empire's Season 4 finale "Farewell Daddy Blues". There is no doubt in my mind that Tim Van Patten will earn a 2014 Emmy nomination for his work on the show's Season 4 finale. HOW MANY EMMY NOMINATIONS DO YOU THINK BOARDWALK EMPIRE WILL EARN IN 2014? LET US KNOW ON OUR FACEBOOK PAGE! Is Aaron Harang Really This Good?